“He was magnificent- he lived BIG – and he was a very big country boy – with goals – with love for our way of life - Trust me, he had no fear – on his first tour I said – ‘keep your head down’ – HE SAID, ‘NO, I’m gonna make that other guy keep his head down.’ -REMEMBER HIS SMILE, HIS ATTITUDE AT OUR WORKOUTS – HE ALWAYS WENT FOR IT – WE WILL ALL MISS THE BIG MAN!" - San Diego running coach Kevin McCarey posting on Facebook about Navy Seal Jon Tumilson, a San Diego runner, who was killed in the helicopter crash in Afghanistan earlier this week. Wanna read a great unrelated article on McCarey? Read this from 2005 when he stopped coaching all together as he tired of coaching soft runners: "I quit because I didn't see effort any more. Nobody wants to put their nose down. Nobody wants to sweat. The typical athlete today is a total whiner." How can I be a responsible adult and still run high mileage? World Championships Marathoner Akaba Gives A Report on Training On Boulder's Famed Magnolia Road Are you under the age of 25 and don't know about Magnorlia Road? Then clearly you haven't read Running With The Buffaloes. is a tech savy Mac guy who has an ipad and does facebook and twitter. 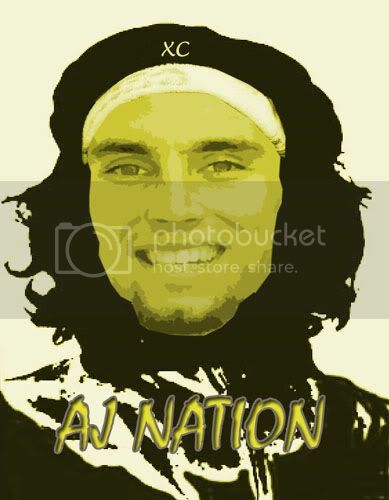 We sure as hell hope he also does letsrun.com. Jamaican 110 Hurdle Record Holder Dwight Thomas Is Buoyed By Outpouring Of Support He's Received Since His Father Was Chopped And Shot To Death His father was a very quiet man and his tragic death is still a mystery. Meet “The sexiest Russian female athlete of the year.” 20-year old European indoor lj champ Darya Klishina is being hyped as a future star. Heptathlete Jessica Ennis' Sets PB of 12.79 To Move To #2 in GB All-Time on 100h List She's only behind the 'plastic Brit' Tiffany Porter. The Legendary Joe Newton (Elmhurst York High School, IL) Admits Getting Softer The Older Ge Gets "The big thing now is I am just listening more. You do that as you mature as a coach." San Diego Runner Jon Tumilson Was One of 22 Navy Seals Killed When Helicopter Shot Down in Afghanistan A memorial run will be held for him on San Diego on Tuesday. 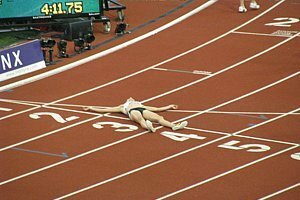 Wanna Be A Pro Runner? Minnesota Star Tribune Takes A Look At How To Take A Stab At A Pro Running Career The Team USA Minnesota people put on a camp, the RunPro Camp, last month trying to help aspiring pros learn how to live a life of poverty pursue their dreams. "Even if you're not one of the superstars of our sport, you have a certain amount of limelight and stardom. To be out there and pursue your dreams is not a reality for a lot of people. It's fantastic to do something you love every day." Team USA Announced For World Championships And Bryan Clay And Lauren Fleshman Are On It The good news that results from USATF having bureaucrats like John Chaplin with dictator-like powers is they don't have to follow their own rules and as a result Lauren Fleshman, America's top 5,000m runner right now, is now on the team, as the rumors of Desiree Davila giving up her spot were true. USATF rules state only 4 runners can chase times but thankfully that stupid rule was somehow ignored. Distance-Related News: Kenyan Govt. Making Unprecedented $upport Of World Championships Team 300,000 shillings, which is a little more than $3,000, goes to gold medallist. If you make the final, you get a little more than $100. Yet somehow, the govt is spening more than $285,000 overall. Quite frankly, we think their govt. should spend nothing. Asbel Kiprop Says Anything But Gold In 1,500 Will Be Disappointment For Kenya - Says Kenyans Fear Only Laalou And Bernard Lagat Asbel, Bernard Lagat isn't even in the event, but Andy Wheating is and he has a better PR than you do. World Championships Silver Medallist Yoshimi Ozaki Runs 50km In Boulder And Is Feeling Good About Her Chances "I can see the scenario where I surge away." Olympic Silver Medallist Richard Thompson Not Given Exemption - Will Have To Compete For Daegu Spot This Weekend A good call as Trinidad & Tobago has 6 sprinters who have the A or B standard in the 100m. Namibia Names Its Team Of 2 For Daegu - 800-Meter Man Is Called Olympic Medal Hopeful Daniel Nghipandulwa has only run 1:46. Non-Distance News: Reigning World HJ Champion Yaroslav Rybakov Of Russia Will Miss Worlds With Foot Injury; Brazilian Team For Worlds Is Released Zero distance men above 800 and only one woman above 200m (10,000). No Longer Lazy, Kaliese Spencer Is World Leader By .50 In 400H Following In Usain Bolt's Footsteps "At first I hated going to the gym, I was very lazy." British Sprinter Harry Aikines-Aryeetey Thinks He Can Break 10.00 In Daegu His PR is 10.10. Having Wasted 4 Years Early In His Career, British LJ Record Holder Chris Tomlinson Looking For Gold In Daegu Fact of the day: His wife is is an actress who was former "Miss Newcastle." 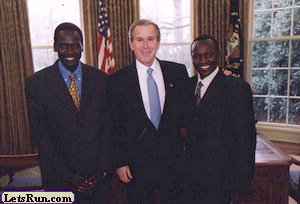 *Kenya's 800m Runners: "We've won psychological war." 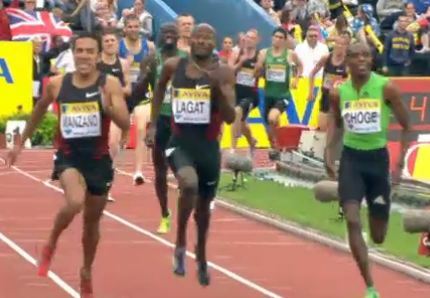 They do realize making the final can be tough, which is why the 800m is the most exciting distance event at Worlds. Britain: British Team Named For Worlds And Goal Is 7 Medals The Brits on the men's side have only two 800m runners entered, one 1,500m runner, and no natural-born Brits in the 5 or 10. *Eilish McColgan's Chance At Worlds Ends With Broken Foot She's the daughter of Liz McColgan. Kenya: Ezekiel Kemboi Shows Up At Kenyan Camp After Secretly Training In Warm-Weather Spot In Kenya Running Road Race In Italy Kemboi claimed to be training in warm weather; instead, he was at a road race in Italy. Thanks to the LRC tipster for sending us the results. Hopefully, Athletics Kenya does not kick him off the Worlds team. *Silas Kiplagat Hoping For Kenya's First 1,500m Gold Ever At Worlds Stat of the day: 4 - the number of medals the US and Kenya have both won in the history of the World Championships at 1,500. Yes, the US has won as many medals as Kenya. *No More Lily-Whites For S. African Teams Track and field is a meritocracy. If whites - or in this instance, blacks - aren't on the team, usually it means they aren't good enough. US: Lauren Fleshman Blogs About Her Amazing Turnaround In London, Crying After Her Debacle In Sweden She could even be named to the US team today, as USATF fortunately may not follow its rules. Spain: After 1st 800 In 2:17, Manuel Olmedo Closes Last 300 In 38 To Win Spanish 1,500m Title And Become A Worlds Contender? Flanders Cup Belgium: Latavia Thomas Runs 1:59.67 - Nearly A 2-Second PR!, Former World Junior Mile Record Holder Ilham Tanui Özbilen Runs 1:44.25, David Torrence Wins 1,500 Congrats to Thomas. Tanui Özbilen is William Tanui Biwott, the world junior record holder in the mile, who would be a darkhorse candidate for gold in Daegu, but he can't compete because he switched to Turkey. Ireland: Irish Nationals Recap: Youngters Impress John Coghlan, Eamonn's son, got second in the 1,500. LRC Day 2: Leo, Lisa And Sanya Impress On day 2 of 2 at the final big meet before Worlds, Leo Manzano got Americans excited for WCs by coming from way behind to get a shock victory in the men's 1,500; British fans got excited by Lisa Dobriskey's win in the women's 1,500; American fans also were probably thrilled by Sanya Richards-Ross' return to form in the 400 (49.66). Plus two Americans got the "A" standard in the women's 5,000, as Lauren Fleshman crushed the field - but was it the right two? *MB: Leo Wow!!!! 3:51 FTW *Lauren Fleshman 15 flat for 5000m *Desi Davilla!!!!!!!! 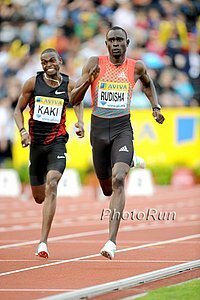 LRC Round 1 Of Kaki Vs. Rudisha Goes To Rudisha On day 1 of 2 at the final big meet before Worlds, the matchup between the two greatest 800m runners on the planet, David Rudisha and Abubaker Kaki, did not disappoint, as Rudisha took down Steve Cram's UK all-comers record. Kenia Sinclair lost her first 800 of the year to Jenny Meadows, as NCAA 400m champ Kirani James appeared for the first time since NCAAs and stamped himself as a favorite in Daegu, Dayron Robles beat David Oliver again as did surprisingly Jason Richardson, Yohan Blake showed he's one to watch in the 100 at Worlds, Jenn Suhr showed she is back, Kaliesha Spencer blasted the 400m hurdles, and Mo Farah ran a 25-second last 200m to toy with the men's 3,000m field. Athletics Weekly: Christian Taylor Arrives (17.68m) He's now the 27th-best man in history and 7th-best American. 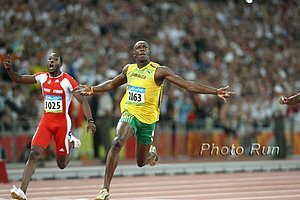 Walter Dix Wins 200m And Says Bolt Could "Definitely Be Beaten" If Walter was in his college form, he might be the one to do it. Molly Huddle Planning On Doing Her First Worlds But Plantar May Keep Her Out She also talks about running the marathon and not breaking the women's 10,000m record. Full Of Confidence, Vivian Cheruiyot Is Eyeing Double Gold At Worlds And Then 5,000 WR After her win last week in 14:20 with "poor weather" and "slow pacesetters," she realized she can get the WR. The crazy thing is she says she wishes Tirunesh Dibaba was in the 10,000 to raise the "level of competition." Nobody In Kenya Knows Where Ezekiel Kemboi Is; If He's Not At Kenyan Camp By Monday, He'll Be Kicked Off Worlds Squad We think he's probably being smart and not burning himself out by training too hard. Telegraph: "It is understood that the greater sensitivity of drug testing equipment to detect the masking agent furosemide, was behind Mullings' positive." Now it's important for people to realize that sometimes people testing positive for furosemide get off scott-free as was the case last month with some Brazilian swimmers. Amazing News!! Every Single Athlete To Be Blood Tested At World Championships *BBC Article On Blood Testing - It'll Be Interesting To See Who Now Pulls Out We agree and all pullouts need to be heavily scrutinized. Back in 2000, we determined Regina Jacobs was on drugs when she pulled out. Caster Semenya Pulls Out Of World University Games With "Niggling Back Injury" We're not sure if this is a made up excuse but the world champ should never have been contemplating running the WUGs. Ridiculous. Someone please hire her a good manager immediately as a few weeks ago a ridiculous press release was issued talking about double world records. 55 Runners Run 5k In Dallas With 109 Temperature At Start Other runners hit the hot pavements and then cool down with beers at the local tex-mex joint. PA Man Charged With Drunken Jogging We hope that the 24-year old charged with the crime contacts us as we think it's ridiculous. IAAF Stifling Religion at World Champs? A local pastor thinks so as the IAAF wanted all four religions to share a room without any religious symbols in it. Instead, he rented a building across the street. Steve Mullings Tests Positive Yet Again The man whom the Letsrun.com nation got pulled from the 2005 NCAA meet after we started a petition (as we were irate that the NCAA wasn't honoring an IAAF drug suspension) has tested positive for a masking agent. It's big news when the man is ranked #3 in 100 and #5 in the 200, but will probably become even bigger when it's pointed out his training partner is Tyson Gay. In fairness to Gay, Mullings was busted once before for cheating before training with Gay and Gay has been a part of the voluntary extra stringent USADA drug testing program. A Highly-Recommended Read Science Of Sport Blog Analyzes Whether The 10,000 Hour Rule Of Deliberate Practice, As Popularized By Malcolm Gladwell, Is True The answer? Nope. Wednesday Was A Big Day For Lauren Fleshman: Lauren Fleshman And Bobby Curtis To Make Marathon Debuts In NY So will Ed Moran and Molly Pritz. LRC Week That Was We go beyond the great action in London to talk about Mo Farah running in Somalia, Ciaran O'Lionaird talking about what it's like to be going to Worlds but not scoring a point at the NCAA meet (when your team lost by 1 point), bureacracy, and good old fashioned hard work. Uninformed AP Columnist: "No reason 'Blade Runner' shouldn't race at worlds." 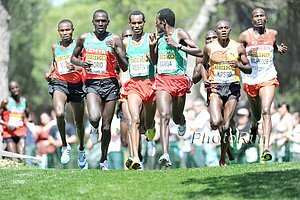 Micah Kogo And Wude Ayalew Headline 2011 New Balance Falmouth Road Race Kogo won TD Bank Beach to Beacon last weekend and is the favorite. There is $10,000 on the line for the winners and $10,000 on the line for first American. AJ Acosta And Will Leer Racing Each Other At 2011 New Balance Falmouth Mile These guys were the most upset after USA Nationals and wish instead they were going to Daegu, but with the European season on hiatus for 3 weeks, it makes this race more interesting. Wude Ayalew's Sister, Hiwot, Could Be A Steeple Phenom The article does not say so, but that is what we at LetsRun.com think. She ran 9:23 in her 2nd (pro) steeple ever and was 11th at World XC. She won't be on the Ethiopian WC team unless they change their minds. Not A Running Star When In School, Eliud Kipchoge Has Gone On To Be A World Beater The article, which takes you through his entire career, says he couldn't even make the final rounds of Kenya in HS but by age 19 was a world champ thanks to huge desire. People forget he beat El Guerrouj and Bekele in 2004. Interesting Read: Having Severed All Ties With Trevor Graham, Justin Gatlin Wonders If Ex-Coach Watches His Race - Answer: Yes The AP caught up with Trevor Graham, who claims Gatlin's current success shows he was clean. And people are wondering why all the nations of the world are about to default on their debt. FSU's Ciaran O'Lionaird Talks About His 6-Second 3:34 PR The guy was a 10k runner earlier in the year, now he'll be at Worlds in the 1,500. 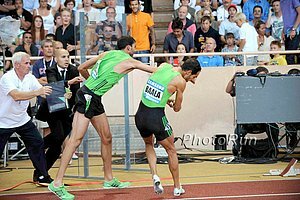 French Runners Mehdi Baala And Mahiedine Mekhissi-Benabbad Can Compete At Worlds Yet supposedly they are suspended for 5 months, fined $2,130 and must do 50 hours of community service. Liz McColgan's Amicable Divorce Gets Nasty As She's Charged With "... repeatedly punching husband and throwing his clothes out the window." 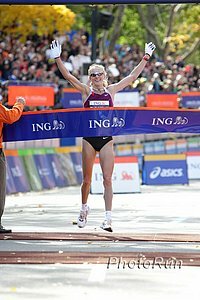 She was the 1991 world 10,000 champ. LRC Paula Radcliffe Healthy And Excited For 2011 BMW Berlin Marathon Friends of LetsRun, Losse Veter, were in Belgium for the new opening of a cool place called Runners Service Lab, and Paula was there too. They talked to Paula about her preparations for Berlin. Paula talks about Berlin, her goals, London 2012, getting it right at the Olympics and even getting older. We 100% Disagree: Tiffany Ofili-Porter Says She's No "Plastic Brit"
We 100% Disagree: Usain Bolt: "I am serious, I believe I could be good at (soccer), I think I could compete well." Adam Goucher Not Done Yet - Hoping To Run Half Marathon This Fall And 2012 Olympic Marathon Trials Anyone who was at the 2000 Trials, where he qualified for the final only on time but made the team, knows not to count him out. Thanks To Janeth Jepkosgei, Eunice Sum Is A Sub-2 Runner Gunning For World Champs A few years ago, she was a 2:09 girl with a daughter, but Jepkosgei came by and said it was time to train. Janeth Jepkosgei Feels She's In Shape To Reclaim 800 Gold Before She Moves Up To 1,500 "I am ready to bring back what I missed in Berlin two years ago and I believe I am in a very good position to do that at the moment," said Jepkosgei. Jeremy Wariner Out Of Worlds A foot injury is keeping him out, although the way he was running, he wasn't likely to medal. Wariner's Injury Will Hurt The US 4 X 4's Chances Of Continuing Its Winning Streak Wariner was on the teams that won in 2005, 2007 & 2009. Athletics Kenya Makes Some Last Minute Changes To Its Roster Rotterdam Marathon champ Philis Ongori Moraa is injured and will be replaced by Delhi Commonwealth Games champ Irene Jerotich Kosgei in the marathon. Even The "Plastic" Brits Still Need That "B" Standard Former Jamaica Julian Reid won the UK Trials LJ and was 2nd in the TJ, but doesn't have the "B" standard in either event, so as of now won't go to Worlds. 75 Years Ago: Jesse Owens Made History At Berlin Olympics Article by ESPN's Jeremy Schaap, who has a book on Owens and the 1936 Olympics. Poll: Vote Online For The Bowerman Award As of now, Washington State's Jeshua Anderson is winning for the men and Texas A&M's Jessica Beard for the women. What's the point of a down week? LRC USA Nationals Contest Recap As usual we had a couple of ringers come out on top in our contest. Our winner is in the elite of the elite of LetsRun.com, as not only has he been to watch the World Championships and Olympic Trials, he has a @runner.org email address, and a real-life wife. Our runner-up was a state champion in high school and has started a post-collegiate group in Utah.